People are being sold an unachievable, impossible fantasy of fuel-free energy with massive and ever-rising costs, that can never work anyway. Climate extremists, like other hucksters, usually emphasize how their favored policies (decarbonization in this case) will avoid various alleged disasters, which never seem to happen except in the distant future, says Alan Carlin. Rarely do they explain what these efforts will cost. Rather, the true believers always claim that the costs are small, even though they actually are not. The costs include (1) higher prices for usable energy, (2) lower reliability of energy supply, and (3) reduced plant growth compared to what there otherwise would be. Higher energy prices are the most easily measured and understood of these costs, and were the basis for the recent Yellow Vest riots in France. The one thing that is never really considered is to cut back on our use of everything but of course that means going backwards and must be avoided at all costs at least unless someone else is paying. It has always been thus – replace a reliable source of power with an unreliable one and the real time costs rise because of the unreliability. Add to that higher cost the cost of government ‘assistance’ to the unreliability and costa go up again. 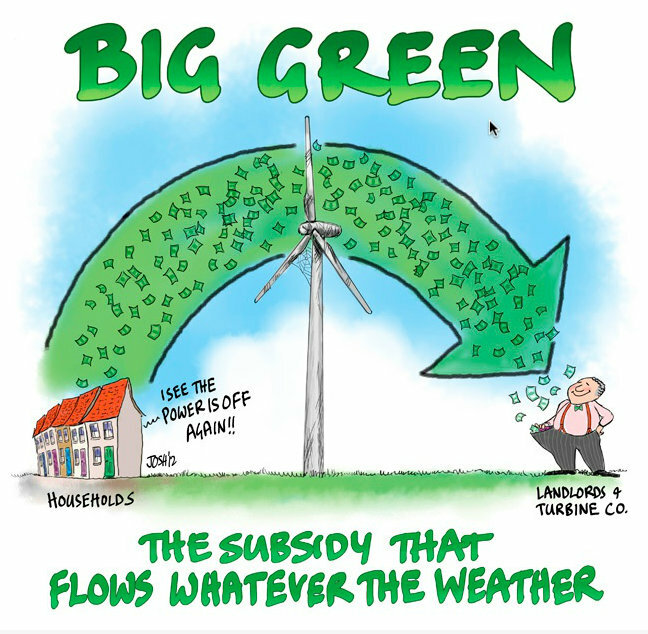 Simce the wind and sunlight is free, the owners of wind and solar farms should be paying us to use the energy they produce after all they have no power source costs unlike the reliable energy producers that have to pay for their fuel. Sure wind turbines have no direct fuel costs but there are other costs, land rental, maintenance, lubricant purchase and usage, etc. The company Infigen in Australia lists it cost at $24 (australian) per MWh. That’s roughly £13 per MWh. I think we an trust their figure as it is no secret that the (now ex) Prime Minister’s son is heavily involved financially with the firm and couldn’t afford a scandal. Is that cost per generated MWh or nameplate MWh and how does it compare with the coal fired generators? Another question, how much do the windfarms pay for the electricity they have to have to keep their machines turning during ‘no wind’ times – is it at commercial rates or do they get it as an additional subsidy? It appears that in Australia, as in the UK green power is well stacked against the consumer be they individuals or businesses. Maybe it is time for the Gilet Jaunes to appear there as they did here in France against the green taxes.